There are currently over a billion active websites online, with more than 300 million of them being blogs. Yes … that is a massive amount of content, however, we still haven’t even talked about social media yet! With all of that in mind… reading numbers all day is great, but seeing visuals to go alongside them is even better. To help with this process, we’ve hand selected some of the best social media focused graphics on the internet today. Each of these social media graphics is special in their own way and focus on growth numbers, promotion methods and how to improve social media engagement and revenue. Be sure to check each of them out below and also start implementing such methods into your own brand or business. While social media and updates might be happening 24 hours a day, 7 days a week, it doesn’t mean that you should publish your content and post it at any given time. The truth is, not all social networks are the same, nor are the ways and times that people use them. For example, did you know that Sunday through Thursday is the best days to connect with consumers from a business perspective? It’s true. Be sure to check out this infographic to improve your engagement and results on social media, just by simply knowing what time of the day works best. When sharing your content on different social media platforms, are you always using the same image sizes? If you are, you could be missing out big time on engagement and quality issues. Facebook and Twitter are two of the biggest social networks for posting content updates, but they are completely different in terms of the image sizes that should be used to represent your content. Check out this social media images infographic to see all the image specs and sizes for Twitter, LinkedIn, Google+, Facebook, Pinterest, and Tumblr. Social media is something everyone uses, whether you are a brand, marketer, business or simply an average person. With so many people using one platform, it’s easy for things to go wrong – just look at any of the major social media PR disasters of previous years. With all of this in mind, it’s always important to make sure you are not set in your social media ways. 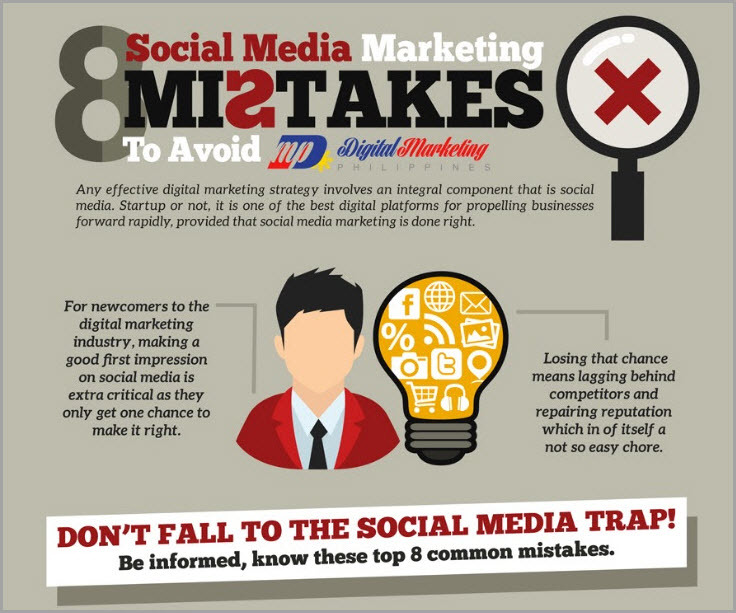 This infographic points out eight different mistakes that are commonly made in the world of social media. Be sure to check it out so you don’t make the same ones. When you hear the phrase “social network”, you probably immediately think about Facebook and Twitter. However, the world of social media is changing and so is the way we connect to the internet. With everyone now using their mobile devices more than ever before, Snapchat has become one of the most successful applications and social networks of all time. Through the infographic above, not only will you see the massive numbers behind Snapchat (which includes 10+ billion daily video views and 110+ million users), but you will also learn how your business or brand can start taking advantage of the platform as well. As mentioned earlier, social media is active at all times of the day… so why are individuals and brands only posting updates when they are only online? This is a perfect reason in itself to start a social media calendar. Through the use of third-party scheduling and social media management tools, it’s easy to manage multiple social media accounts and always have content going live at different times. This is also a great way to make sure your older content is always getting a fresh and consistent flow of click activity. 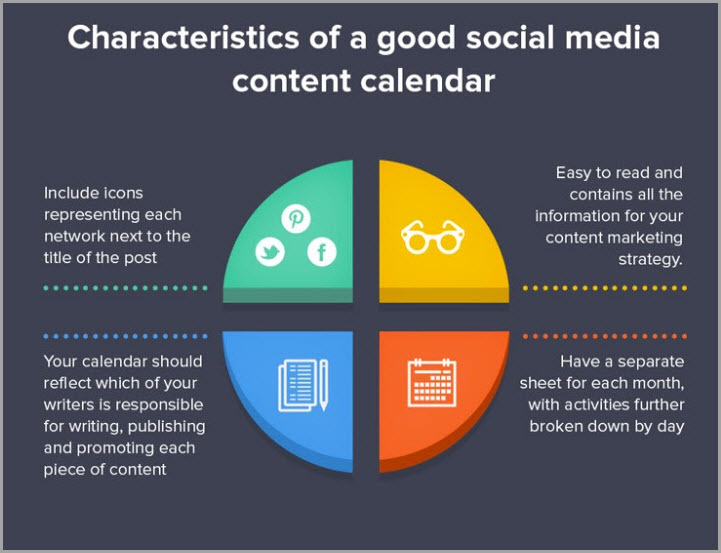 Check out this infographic for everything else you need to know about social media scheduling. Of all things we know about social media, one thing is certain – it’s way too time consuming and costly to try and manage all social media networks and updates manually! Thanks to the power of tools like Hootsuite, Buffer and Meet Edgar, the management of social media has become much easier. However, it would be a huge mistake to just rely on the most well-known social media tools. 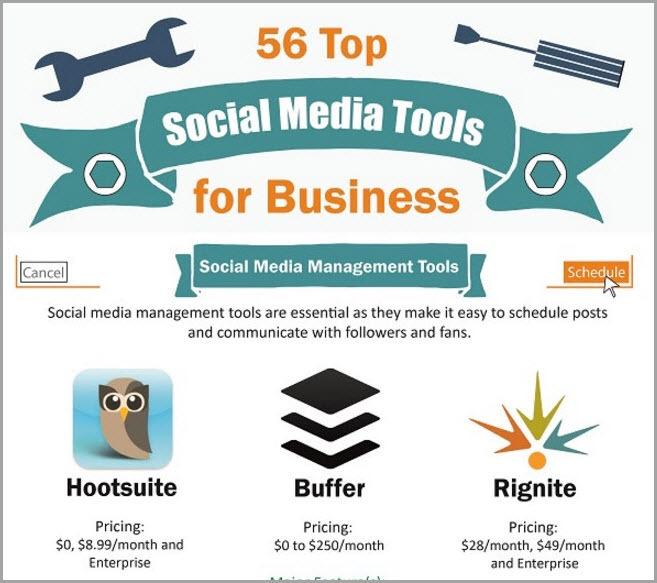 To see what other types of tools and automation is out there, be sure to check out this infographic list of 56 other social media tools that every business should be using today. If you want to get the most out of social media, you need to know how to engage with your audience and give them what they want. For example, if you have an entertainment blog, your social audience will want updates and content based around celebrities, trending events and fun posts to waste their time. On the flip side, if you are a business or brand that sells a product, you will need to come up with valuable content for your audience while also figuring out how to properly monetize it in the process. 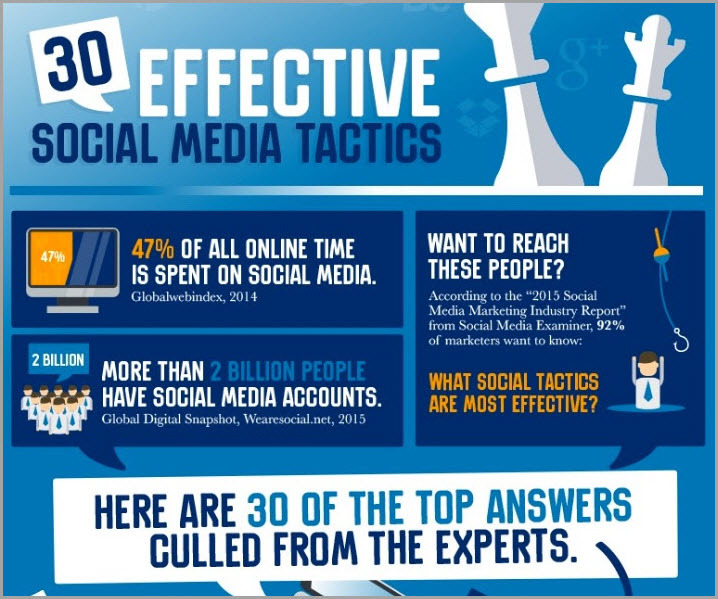 Through the infographic above, you will get some great ideas from the 30 different social media tactics laid out for you. Try each of them with your existing audience and always keep user value in mind. It’s very likely that you are already on social media, but are you currently using it to its full potential? No matter if you are a blogger, brand or mega-business… social media is useful for everyone. Be sure to run through each of the social media infographics above, as they are based on proven tips, trends and marketing methods for businesses and brands of all sizes. ABOUT THE AUTHOR: Zac Johnson is a world-renowned blogger and entrepreneur with nearly 20 years of experience in the online marketing space and has helped his readers generate millions of dollars online. He shares his story and guidance at ZacJohnson.com. 5 Digital Marketing Predictions For 2017; And 2 Anti-Predictions Which We Regret This Year! What Should I Pay for My Logo Design?